‘Consent Matters’ a Gold winner at the Learning Technologies Awards 2017! We are thrilled to announce that our course Consent Matters: Boundaries, Respect and Positive Intervention won Gold in ‘Excellence in the Design of Learning Content’ for the UK Commercial sector category of the Learning Technologies Awards 2017. With over 400 applicants for the awards this year, including some top industry names and large organisations, we were delighted to be shortlisted in the final 7 of our category and we are now immensely proud and pleased our hard work on this course has been acknowledged with a Gold award. Consent Matters received some great feedback, as the judges praised the topicality of the course and the high quality of our learning materials. The project addressed a clearly defined need concerning difficult and delicate subject matter and was extremely well aligned with its diverse, global audience. The rich content was thoroughly researched and constructed, showing great attention to detail and high-quality case studies, scenarios and interactions throughout. It is a superb example of investing in the research phase to develop a strong authentic narrative which is clearly engaging an audience not only to invest time in this learning but to continue those conversations into daily life. Want to hear more about Consent Matters? 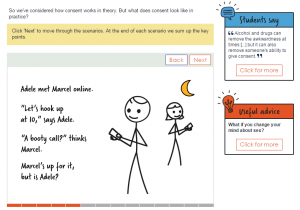 Consent Matters is an interactive online course that has been developed to empower students to understand sexual consent and to implement positive change in their university communities. It combines a range of perspectives, tools, and exercises for an engaging and relevant learning experience. The course takes a positive rather than a punitive approach, emphasising the importance of prevention through key areas, such as communication and bystander intervention. It is currently being used by 51 institutions around the world, including 24 universities and 8 colleges in Australia and 16 universities in the UK. 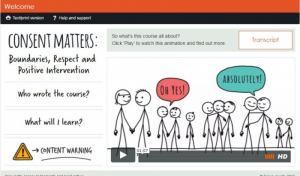 Introductory animation to ‘Consent Matters’. Consent Matters is available for free, no obligation trials for institutions – register for your free trial using the form below. Interested? We also have a course specifically developed for staff, Responding to Disclosures of Sexual Violence.